Once a true medical oddity, children with adult diabetes are becoming commonplace. Doctors blame the twin evils of too much food and too little exercise and fear a tragic upswing in disastrous diabetic complications as this overweight generation reaches adulthood. At hospitals everywhere, boys and girls who range from chubby to hugely obese are being diagnosed in unprecedented numbers with type 2 diabetes. Most are barely into their teens. Some are as young as 6. This disease used to be called adult-onset diabetes, since it rarely occurred before middle age. But over the past decade, it has slowly become clear this is now a disease of the young, as well. Just how frequently is uncertain, since nationwide statistics are still being gathered. Nevertheless, doctors are convinced they see the leading edge of a dangerous shift, one that will inevitably lead to kidney failure, blindness, heart attacks, amputations and more as these young people live another 10 or 20 years with their diabetes. "There is an epidemic of type 2 diabetes in youth, absolutely," says Dr. Lori Laffel, head of the pediatric unit at Boston's Joslin Diabetes Center. "Over the years, we always saw an occasional child with type 2. It was a handful a year." But in the early '90s, the pattern changed. Out of the blue, it seemed, large children, usually accompanied by overweight parents, began to show up with type 2 diabetes. During the early '90s, Joslin's totals increased five times. Since then, they have doubled again. Until this shift, almost all diabetes in children was type 1, what was called juvenile diabetes. In many ways, it is a different disease. Type 1 results from a misguided attack by the immune system on the insulin-making cells in the pancreas. Victims stop making insulin completely, so they cannot convert sugar to energy. But type 2 has always been a disease of people in their 50s, 60s and beyond. Their bodies still make insulin, just not enough. They may go for years without realizing they have it. Around the country, doctors say Joslin's 10-fold rise in childhood type 2 over the past decade is typical. Is it because they are looking harder or doing a better job of separating type 2 from type 1? Not likely, they say. "It's not because we missed a lot of cases," says Dr. Phillip Lee, head of pediatric endocrinology at UCLA. "We just didn't see it. 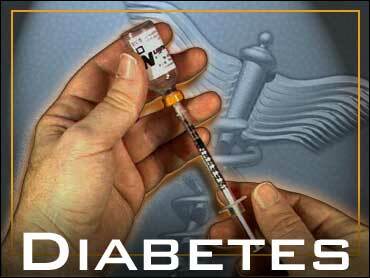 Now referrals of type 2 are almost 50 percent of our diabetes cases." Virtually all children with type 2 are overweight, although this hardly makes them unique. The Centers for Disease Control and Prevention recently estimated that 15 percent of all U.S. children and teenagers — and nearly a quarter of black and Hispanic youngsters — weigh too much. Still, the ones with diabetes tend to be especially big, tall for their age and large all over. Twelve-year-olds weigh 250 pounds. Invariably their parents are heavy, too. "These are not little kids," says Dr. Morey Haymond, head of diabetes care at Texas Children's Hospital. "Even the 6-year-old is a big kid for his age." Nearly all of them have a skin condition called acanthosis nigricans, velvety, dirty-looking dark patches around the neck and other skin folds. They are a sign of insulin resistance, an inability to respond efficiently to insulin, which is common in the overweight. In girls, the insulin resistance often triggers hormone upsets that result in facial hair, acne and ovarian cysts. Young blacks and Hispanics have more of this kind of diabetes than do whites. Their extra weight alone may explain some of it, although experts believe these minorities also may have an extra genetic tendency toward diabetes that is compounded by their weight. Many who do not have outright diabetes still have abnormalities that put them at high risk for diabetes. Doctors estimate that for every youngster with type 2, four or five others have what's called syndrome X or metabolic syndrome, a combination of obesity, insulin resistance, bad cholesterol counts, high triglycerides and high blood pressure. "Unless we make a significant alteration in their lifestyles, they will likely progress to a deteriorating course of insulin resistance, pre-diabetes and diabetes," says Dr. Francine Kaufman, endocrinology chief at Children's Hospital Los Angeles and president of the American Diabetes Association. Adults with type 2 diabetes face many complications that shorten or worsen their lives, although these can be reduced or prevented with medicines, weight loss and exercise. The diabetes association recommends testing children for type 2 diabetes if they are overweight and have two other risk factors, such as a parent with the disease, signs of insulin resistance or if they are black, Hispanic or American Indian.